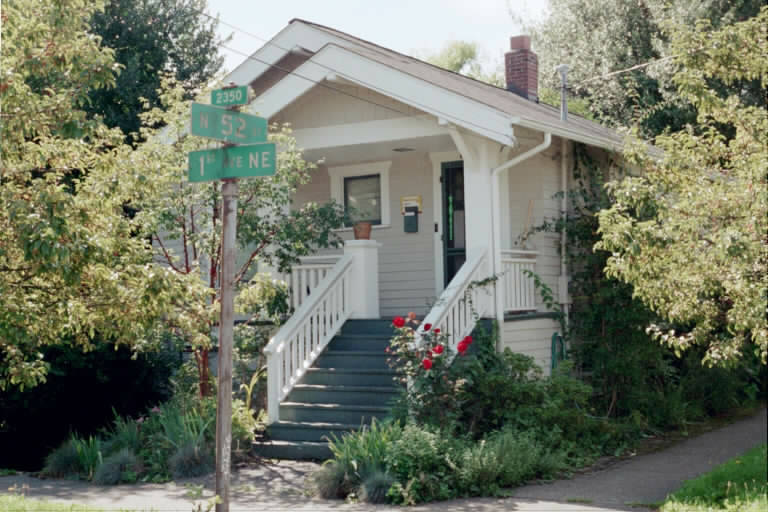 This small and simply ornamentad craftsman bungalow was designed and built by owner John Collins, in 1912 according to the building permit. The fact that Mr. Collins filled all three roles suggests that he was a designer/builder involved with speculative development in Wallingford (as well as other neighborhoods north of Lake Union). The house is a very plain and relatively inexpensive -- it cost $1,300 to build according to the permit -- example of an early 20th century bungalow and represents a number of structures of this type and form built in Wallingford during the neighborhood's first big construction boom in the period from 1906 to 1915. The garage was added to the basement in 1926 by contractor J. B. Williams for owner J. D. Nece (or Nice according to the Assessor's records). One story, wood clad frame residence on concrete foundation with full basement. Wood clapboard siding covers the body of the house, wood shingles are used in the gables. The low slope, simple front gable roof is typical of the craftsman bungalow style. The gabled front porch projects from the front of the house; the wood entry stair and railing appears to have been replaced but large square columns supporting porch roof appear original. The windows and trim appear to be original. The windows seem relatively sparse. The exposed rafter tails are now partially hidden by added gutters. The garage door appears to have been replaced.